One of the first projects in the digital humanities to prototype a VPL for text analysis was the EyeConTact project by Geoffrey Rockwell and John Bradley. 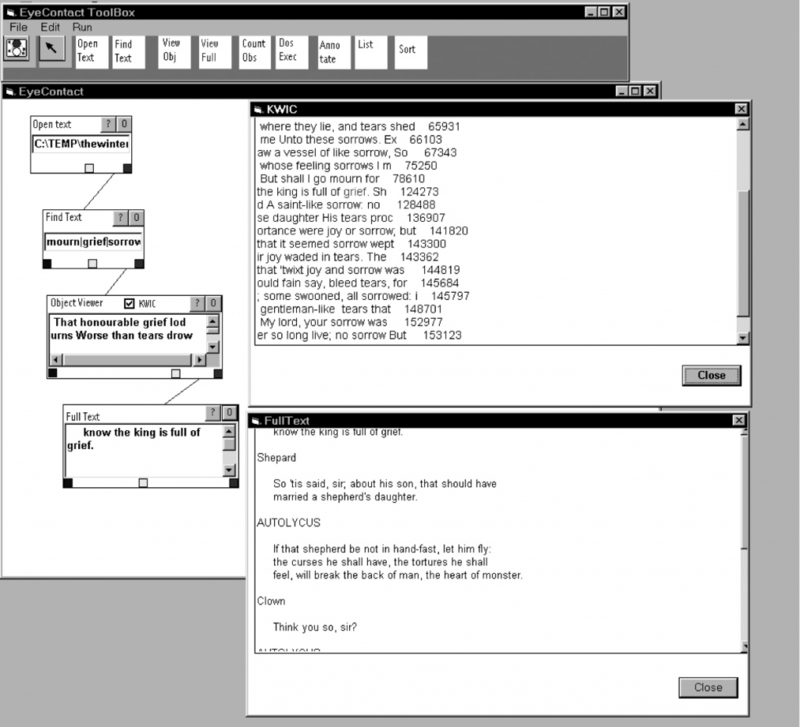 See also a paper Seeing the Text Through the Trees: Visualization and Interactivity in Textual Applications from LLC in 1999. This was inspired by scientific visualization tools like Explorer. Before that there were many projects that shared flowcharts of their programs. 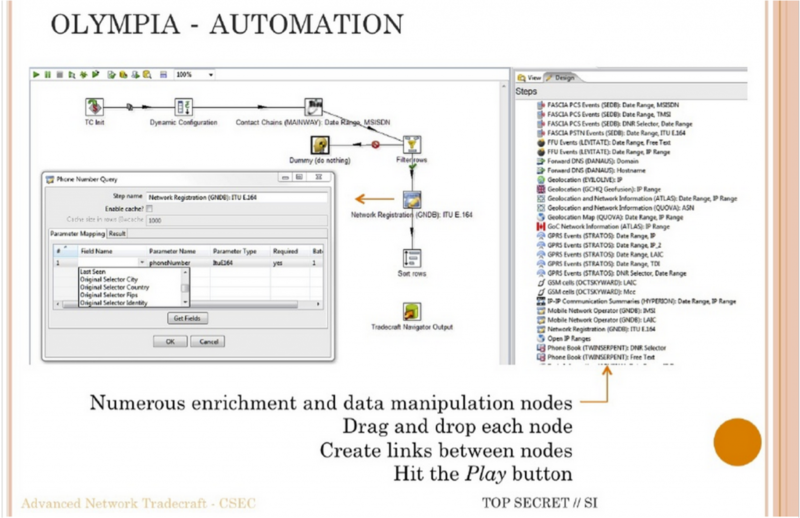 For example we have flowcharts of both how computers fit in scholarly concording and how the concording tools worked for PRORA. One can see how generations of programmers raised on flowcharting their programs would desire a flowcharting tool that actually was the programming. The SEASR project developed a much more sophisticated VPL called Meandre. See Ian Milligan’s discussion of using Meandre. Meandre was designed to allow humanists a way of using all the power of SEASR. Alas, it doesn’t seem to be still maintained. The best system currently available is built on an open VPL called Orange. Aris Xanthos has developed text analysis modules for Orange called Textable. Xanthos has a paper on TEXTABLE: programmation visuelle pour l’analyse de données textuelles (French). Orange is a well supported VPL that can be extended. Visual vocabulary is not always clear. What does a pipe mean? What direction do pipes go? Left to right? What flows through a pipe? Domain specific applications work best. VPLs are good at the visualization of process (and data and results in that context). They show rather than hide the processes in a way that can be explored and fiddled with. They are good for showing the chain of filters and transformations that data goes through. VPLs are slower than traditional coding for proficient programmers. It is hard to handle a big codebase with a VPL as you end up hiding chains. The are good a showing chains of processes, but not at showing highly interactive systems. Above all, as mentioned above, we need to learn to read visualizations (including VPLs) in the humanities. These are forms of communication that are increasingly important in the algorithmic state. They are used widely in business and government. They are essential to understanding how big data is consumed and used. I propose that developing a discourse and hermeneutics of visualization is fundamental to developing better visualization tools. The two go hand in hand.